This beautiful piece was done by Martha VanLoan. Ch Freespirit Fame n'Slomoshun & Ch Riverbanks Zephyrus. 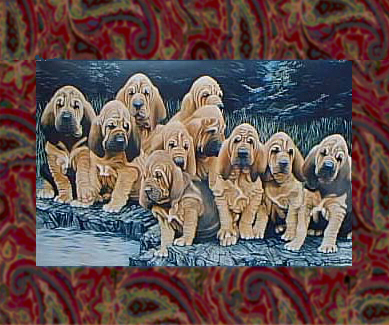 The Liver & Tan pup, front center, is Sharon Bardin's beloved "Peaches." The pup on the far right is The Maja, owned by Suzi Paine and Terri Coffey. The Maja lived with and was treasured by Suzi all her life. No one could have asked for better homes. Martha VanLoan now lives in Springfield, Oregon. She has many beautiful prints of Bloodhounds and other breeds. If you wish to view her work, please click on her name above. then onto "Bloodhounds" to view this and other beautiful works of art.